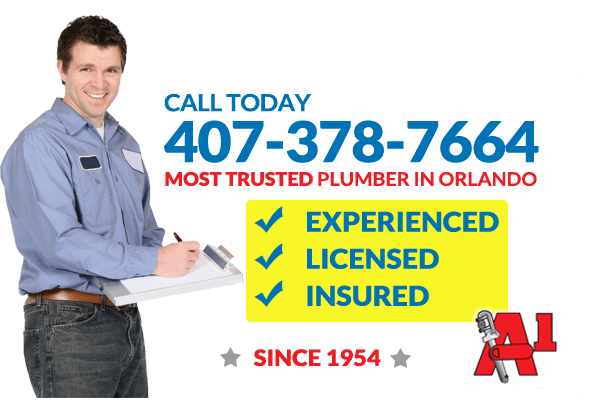 In case you have been searching for renowned Winter Park Plumbers to handle all your household plumbing services, look no further than A1 plumbing Service. With over 50 years of experience in the plumbing craft, A1 plumbing service has been providing plumbing services for Orlando, Winter Park, and Central Florida. Several residents of Winter Park and Orlando, rate A1 Plumbing Service with the best Plumbers in Orlando. This is confirmed by the volume of the positive review that we have received regarding our Winter Park plumber services. In fact, our rating score reveals that through the years, we have earned top rating due to our devotion to detail and importance on outstanding customer service. A1 Plumbing Service offers high-quality repiping service. This service is very useful to help all customers fix any problems associated with corroding pipes or leaky faucets. It is important to fix any piping issues immediately in order to avoid getting any further problems in the future, which will ultimate cost you significantly more. We also offer our plumbing services to the Orlando and Winter Park area 24 hours a day, 7 days a week. We pride ourselves on being the most reliable 24-hour plumber in Orlando and believe that you deserve to have the problem fixed in the most timely fashion possible. Our well-experienced Winter Park Plumbers will definitely be able to get all your plumbing issues fixed. We are here for you day in and day out, all around the year. At A1 Plumbing Service, our number one goal is your happiness, satisfaction, and sense of value in the service that we come to your home to provide. We aim to be the top rated Orlando plumbing company for years to come! Our professional Winter Park Plumbers have been known all over Winter Park, Orlando to offer top-notch plumbing services to the residents of Winter Park, Orlando, and their neighborhood. Our 24-hour plumbing in Winter Park means that we always show up at your home with all the needed equipment, on time, well dressed. We are also well prepared to provide the appropriate fix to your plumbing problems as fast as you can possibly imagine. Our Winter Park Plumbers will also work to ensure that you are offered outstanding plumbing services that will surpass your expectations. This is what distinguishes us from other Plumber in Orlando. Is the plumbing system of your home giving you sleepless night? Is your toilet broken? Are your pipes leaking? Do you have a blocked drainage system? Has your water heater, septic systems showers, and tubs develop serious problems? Do not panic. Simply call A1 Plumbing Service we will be right there to fix the issue. Call our Orlando plumbers today to schedule an appointment! We work all round the clock to ensure that your plumbing systems are in good condition.